There's a good reason promotional pens and pencils are such popular items...they work! Click-action, twist-action, translucent design, ballpoint, roller ball, metallic, grips...the options are endless. These cutting-edge designs appeal to a large number of audiences. Your clients and prospects will be using your brand throughout their entire day and your business will literally be in their hands. 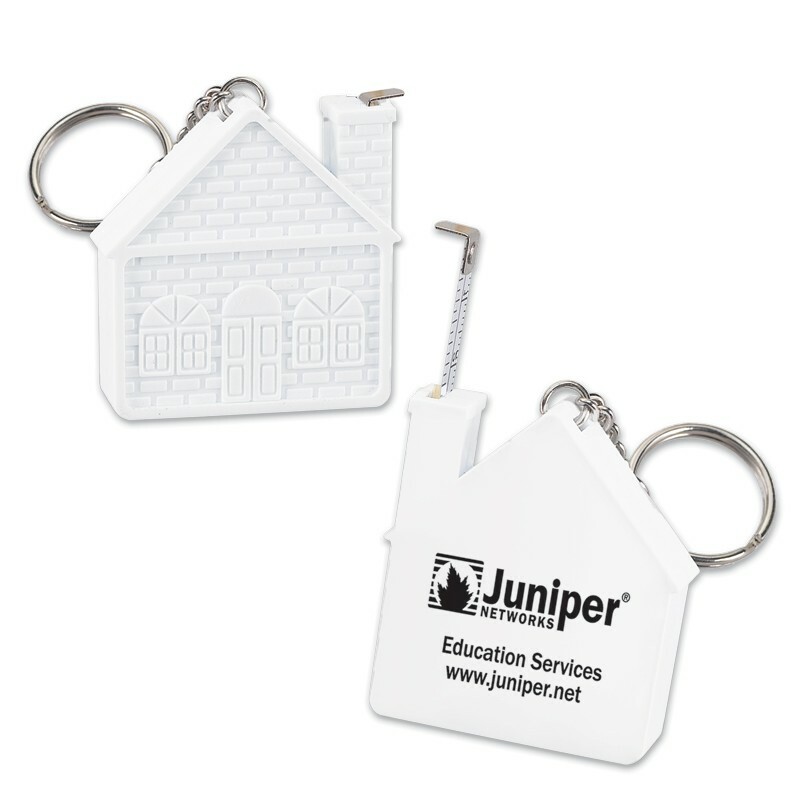 Make your mark on the real estate industry with our personalized pens and custom pencils. The BIC Clic Stic Pen is the most popular retractable pen on earth. This click-action pen won't disappoint you or your customers! 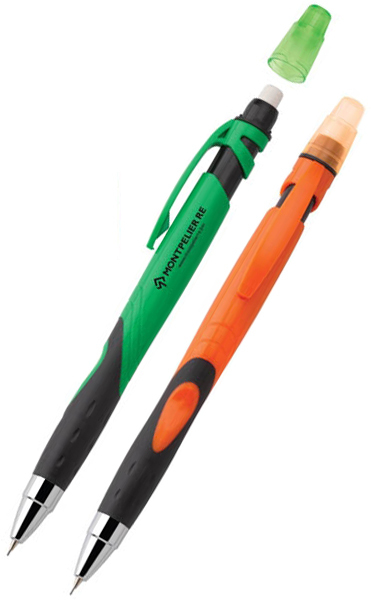 Customize your BIC Clic Stic Pens any way you want by mixing and matching barrel and trim colors. With over 400 color combinations, the possibilities are endless! A good branding strategy should always include a basic but impressive writing instrument, and that is the BIC Clic Stic Pen! The customized Scripto Author Click Pen leaves other pens in its wake. This ruthless competition-killer is a personalized pen that will pierce anyone that gets in its way. The classy barrel with chrome accents hides a precision German blue ink cartridge. 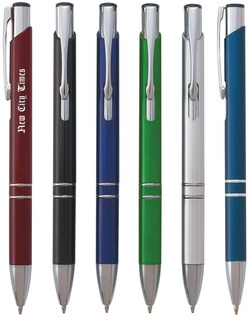 Available in four colors, this Scripto branded pen is ideal for your next promotion. 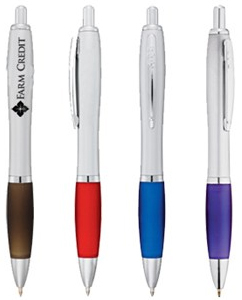 These logo Cougar Pens don't belong in a zoo...they belong in your next promotion! These customized pens are available in colors that you'll never see on a real cougar. 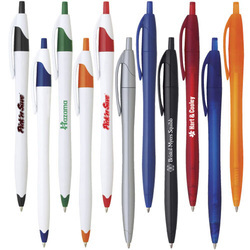 Once your logo is added, this pen will be an unstoppable force in your networking programs! The Cougar Pen is sleek, just like its animal namesake, and it's sure to generate positive comments about your brand. We know it's hard to believe, but this pen isn't a figment of your imagination! It's quite real, and it is amazing. The customized Mirage Pen is more than just a writing instrument. 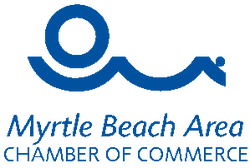 It's an invaluable marketing tool that will point your brand in the right direction! You can choose black, blue, slate blue, burgundy, green, and matte silver. The price of The Mirage Pen probably seems too good to be true but those are the real prices! 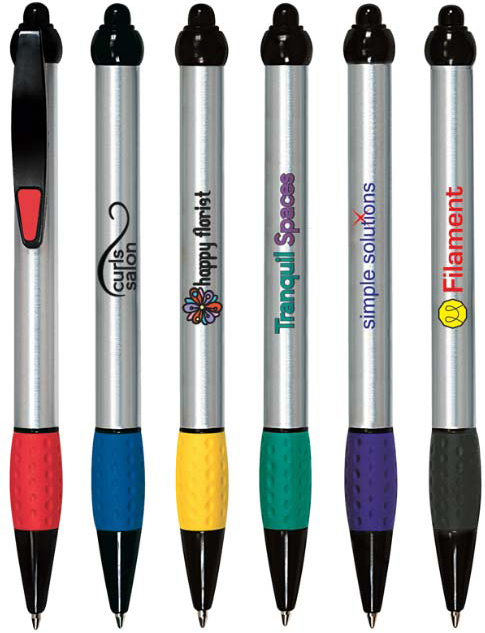 Infuse your brand with colorful pens - these custom Blazer Pens, to be exact. This custom click pen knows what's best for your advertising, so let it blaze to the finish! With bright accent colors and comfortable grip, the Blazer Pen is just the "write" pen for your next networking event or open house. Each Blazer Pen is made with a medium point and black ink cartridge to create a professional look when your client uses it to sign on the dotted line. 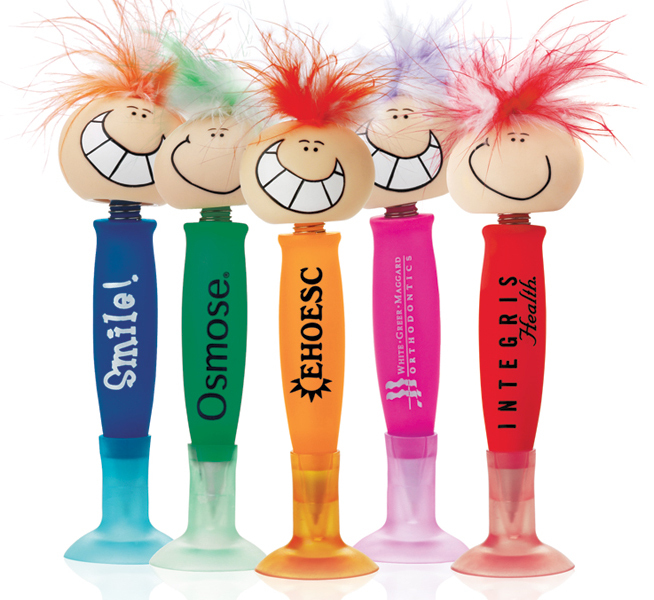 These funky goofy pens will make any client or prospect smile. These bobblehead pens with funny heads will turn heads. Choose them from their funny faces or feather. Goofy pens are cool, creatively designed pens that make great promotional giveaways. So, when you ask yourself what makes a good giveaway that you will be remembered, the goofy pen is one to consider. When it comes to cool custom pencils, these Fame Pencils hit the spot! This custom pencil features a stylish visual design that any user will enjoy...especially when your brand is imprinted across the side. The mechanical push-action design is highlighted by the matching colored barrel, removable cap and chrome tip! 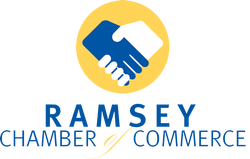 The fantasy of most of your clients and prospects is to have a reliable sidekick to help them keep dates, and remember phone numbers. So give them the assistant of their dreams with these custom pen/highlighter combos! This pen/highlighter combo features black ballpoint ink, curvy metallic barrel with matching color grip and matte silver accents that come together to form a combo that is as easy on the eyes as it is on the fingers and paper. 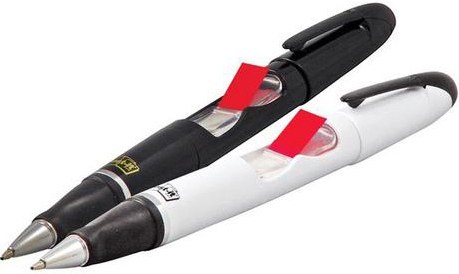 This double duty pen makes it easy to flag those important real estate documents. Make sure every mortgage broker and attorney have a bunch of these pens on their desks. 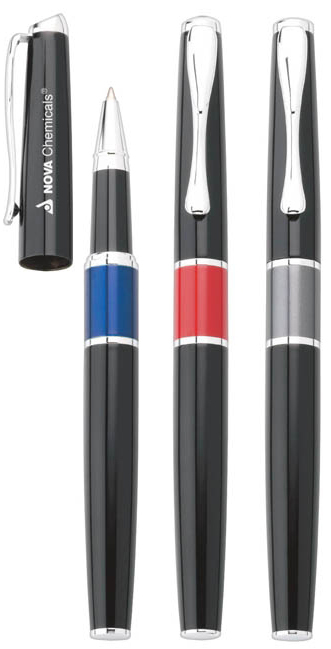 Combine the flags with a classic ballpoint pen and you have a home run for your next promotion. The customized Bristol Roller Ball Pen will put you in the hands of potential clients everywhere with maximum retention for incredible brand recognition. When you put your name and contact information on the side of a great item like the Bristol Roller Ball Pen, you're investing in an awesome promotional product. 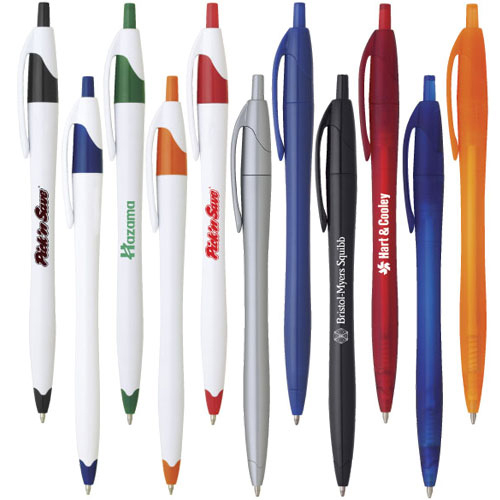 Add some style to your marketing program with this Roller Ball Pen. Like an imprinted roller ball pen on steroids, then you'll love the BIC Z4+ Roller Ball! 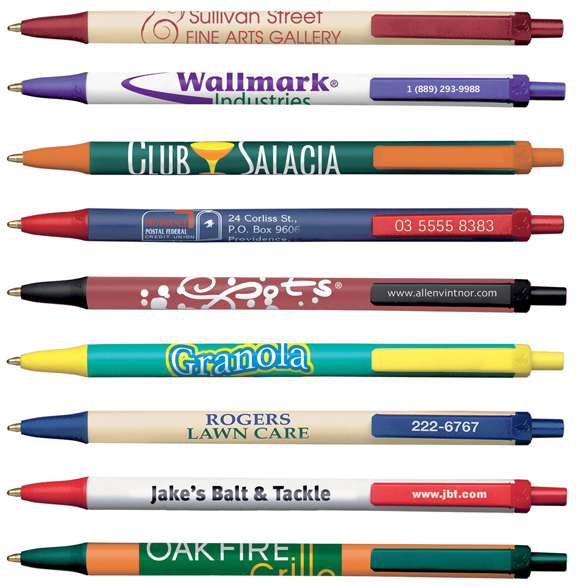 These roller ball pens are perfect for leave-behinds, networking events or mailers. Take advantage of its extreme writing capability and free ink roller technology! The clear barrel of these capped roller ball pens allows you to check the ink level before and after each and every use. Its stylish cap keeps the pen tip safe from harm. 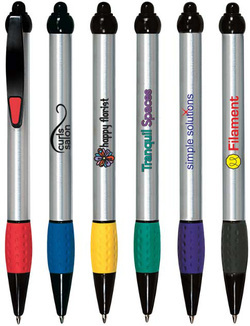 Add your brand to the barrel of this clear plastic pen and you will be amazed how well your logo stands out! When it's impossible to put your brand on a majestic mountain, go for the Majestic Roller Ball Pen! You'll be stunned by this pen's detail. Each have a pull-off cap, chrome trim and colored center band. Its weight is heavier than that of run-of-the-mill metal pens, so it'll take more than a breeze to blow it away! The phrase "purple mountain's majesty" takes on an entirely new meaning with these shiny, metal barrel pens.